I had been recalled to the side after four years to play at my home ground in this Test, and I was very excited. I had been having a good domestic season but was still surprised to be picked ahead of Greg Matthews. Anyway, once you get an opportunity you've got to snap it up, and that's what I did. 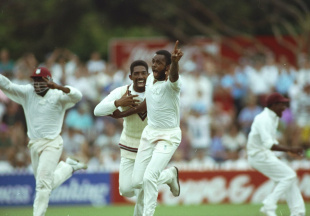 I got two wickets in the first innings - Desmond Haynes stumped off a terrible full-toss down the leg side, and Keith Arthurton caught at point - and I felt my comeback was coming along okay. West Indies got only 250-odd, but when we batted, Curtly Ambrose and Courtney Walsh, along with Ian Bishop and Kenny Benjamin, did enough to keep our batsmen in check. Ambrose was pumped up, especially after the incident during the tri-series where Dean Jones had complained about his wrist band obstructing the batsman's vision when Curtly was bowling. After that Curtly had shifted to a higher gear; he was hunting us down. He finished with six wickets in our first innings, giving his side a lead of about 40 runs. West Indies had added some 100 runs to their lead when Allan Border brought me on to bowl. He had wanted to bowl me earlier but I had had a fielding mishap: I had managed to puncture my thumb with one of the spikes on my boot, and had got my hand strapped. But when I came back and picked up the ball and bowled practice balls to AB at mid-off, it just felt scarily good. There are days when you just struggle to hold on to the ball - you can't put as much zip on it as you want because the seam is flat or the field has made the ball slippery. But that day it felt terrific. It was the third day, and the Adelaide Oval pitch had bounce and a bit of turn. It was a good wicket to bowl spin on, and things just went my way. I bowled a ridiculously small number of overs (6.5) for a ridiculously large number of wickets (five). The first one was the danger man, Carl Hooper, caught in the deep by Merv Hughes when he top-edged a sweep. The rest followed so quickly that it felt like a blur. It was terrific that I had got five wickets and had restricted the opposition to 146, but I didn't feel too satisfied. When you take five for 60-odd off 30-odd overs, and you have to work hard and use your head, it feels satisfying. Here I felt like I had not earned the wickets, well as I may have bowled. The next day, Australia Day, was also my birthday. We only needed 186 runs and we had two days in which to get them. But by the time I walked in, things had gone pear-shaped for us. Ambrose once again bowled a significant spell just after lunch, picking up the wickets of Steve Waugh and Border in quick sucession - two backbone-y sort of batsmen. That was a big blow. I was feeling pretty confident, though, when I joined Justin Langer, who was making his debut. We needed a little over 80 runs. It was the last over before tea and I cover-drove the last ball, off Bishop, which added to my confidence. In the dressing room during the break Langer and I agreed: "Yeah, mate, we're gonna make a fist of this." We inched ahead, but then Langer got out with 42 still needed. Last man Craig McDermott wasn't a success against fast bowlers and I thought the end was nigh. But he stuck around courageously, batting straight and making runs, and that gave me hope. We refused to look at the scoreboard because that takes your mind off the most important thing, which is the next ball. We kept getting closer and closer and the crowd kept getting bigger and bigger and the chants of "Waltzing Matilda" grew louder and louder. When we were just one run behind, Craig tried to fend off a Walsh bouncer and was given out caught behind in controversial circumstances. I was in a poor position to judge because when Craig tried to avoid the ball, his back was towards me. There was definitely a noise, and lots of people had plenty to say later about what exactly the ball hit. Back in the dressing room, though, no one said anything for 20 minutes. There was nothing left to say. It was so bloody close in the end. The one-run defeat - still the only game in Test-match history to have finished by that margin - still bites me. When I batted, I kept saying to myself, "It's Australia Day, it's my birthday; of course, we're going to win." It didn't work out like that. Frustrating. It continues to hurt still.